Ferial Haffajee is editor-at-large of Huffington Post South Africa. She is also editor-in-chief of a Pan-African investigative journalism portal called the African National Centers for Investigative Reporting (ANCIR). 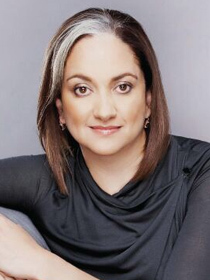 Previously, Ferial edited two leading South African titles: the Mail & Guardian as well as City Press. She has won an International Press Freedom award from the Committee for the Protection of Journalists in New York and been named editor of the year twice. She was awarded the Phil Weber prize, the Naspers group’s highest internal honour. Ferial is a moderator with the Aspen Institute’s Aspen Global Leadership Network and the Africa Leadership Institute. Ferial’s book “What if there were no whites in South Africa” was launched in January 2016.